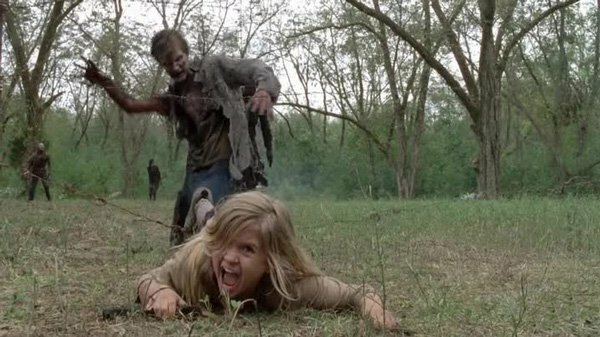 Poll: Do You Let Your Kids Watch The Walking Dead? Do you let your kids watch The Walking Dead? The Walking Dead is a popular show that comes on at 9 p.m. That’s still solidly in family TV time for many people. It’s also available on Netflix and on home video, so there are many opportunities for the younger set to come in contact with the show. Kids are watching. Should they? There are persuasive arguments for both sides. On the one hand The Walking Dead’s TV-MA rating is well-earned. The show can be violent, to both walkers and people. It has its fair share of cursing. And the general concept of an apocalyptic zombie invasion and the walkers themselves can be disturbing. But on the other hand most of the violence is rooted firmly in a fantasy scenario. Despite its darkness the show has a positive message rooted in the importance of family and in never giving up no matter how badly screwed you appear to be. For the purpose of this poll let’s define kids as 12 or younger. The poll is anonymous so you can give an honest answer without worrying what people might think, or you can comment below and explain your reasoning. And even if you don’t have kids you can participate. Just tell us what decision you would make if you did have kids.